An initial public offering ( IPO ), or stock market launch, is a type of public offering where shares of stock in a company are sold to the general public, on a securities exchange, for the first time. Most companies undertaking an IPO do so with the assistance of an investment banking firm acting in the capacity of an underwriter. Underwriters provide a valuable service, which includes help with correctly assessing the value of shares (share price), and establishing a public market for shares (initial sale ). A secondary offering is not dilutive to existing shareholders, since no new shares are created. The proceeds from the sale of the securities do not benefit the issuing company in any way. The offered shares are privately held by shareholders of the issuing company, which may be directors or other insiders (such as venture capitalists) who may be looking to diversify their holdings. Usually, however, the increase in available shares allows more institutions to take non-trivial positions in the issuing company which may benefit the trading liquidity of the issuing company’s shares. Private placement (or non-public offering) is a funding round of securities which are sold not through a public offering, but rather through a private offering, mostly to a small number of chosen investors. “Private placement” usually refers to the non-public offering of shares in a public company (since, of course, any offering of shares in a private company is and can only be a private offering). Stock repurchase (or share buyback) is the reacquisition by a company of its own stock. In some countries, including the U.S. and the UK, a corporation can repurchase its own stock by distributing cash to existing shareholders in exchange for a fraction of the company’s outstanding equity; that is, cash is exchanged for a reduction in the number of shares outstanding. The company either retires the repurchased shares or keeps them as treasury stock, available for re-issuance. Companies making profits typically have two uses for those profits. Firstly, some part of profits can be distributed to shareholders in the form of dividends or stock repurchases. The remainder, termed stockholder ‘s equity, are kept inside the company and used for investing in the future of the company. If companies can reinvest most of their retained earnings profitably, then they may do so. However, sometimes companies may find that some or all of their retained earnings cannot be reinvested to produce acceptable returns. Over-the-counter (OTC) or off- exchange trading is to trade financial instruments such as stocks, bonds, commodities, or derivatives directly between two parties. Dealer markets, also called quote -driven markets, centers on market-makers (or dealers) who provide the service of continuously bidding for securities that investors want to sell and offering securities that investors want to buy. securities: Synonymous with “financial instrument. ” A tradable asset of any kind; either cash, evidence of an ownership interest in an entity, or a contractual right to receive or deliver cash or another financial instrument. swaps: A swap is a derivative in which counterparties exchange cash flows of one party’s financial instrument for those of the other party’s financial instrument. forwards: A non-standardized contract between two parties to buy or sell an asset at a specified future time at a price agreed upon today. The major stock exchanges are the most visible example of liquid secondary markets – in this case, for stocks of publicly traded companies. Exchanges such as the New York Stock Exchange, Nasdaq, and the American Stock Exchange provide a centralized, liquid secondary market for the investors who own stocks that trade on those exchanges. Most bonds and structured products trade “over the counter,” or by phoning the bond desk of one’s broker-dealer. Over-the-counter (OTC) or off-exchange trading is to trade financial instruments such as stocks, bonds, commodities, or derivatives directly between two parties. It is contrasted with exchange trading, which occurs via facilities constructed for the purpose of trading (i.e., exchanges), such as futures exchanges or stock exchanges. In the auction market format, buyers and sellers are brought together directly, announcing the prices at which they are willing to buy or sell securities. “Orders” are centralized by the market, so highest bidders and lowest sellers are exposed to each other. The New York Stock Exchange is a notable secondary market that is structured as an auction market. The NYSE trades in a continuous auction format, where traders can execute stock transactions on behalf of investors. They will gather around the appropriate post where a “specialist” acts as an auctioneer in an open outcry auction market environment to bring buyers and sellers together and to manage the actual auction. Broker markets are usually only used for securities that have no public market, necessitating the middleman in the form of a broker. When a client asks their broker to fill an order, it is the broker’s job to track down trading partners. The broker provides information about potential buyers and sellers and earns a commission in return. Municipal bonds are often traded in this way. Dealer markets, also called quote-driven markets, centers on market-makers (or dealers) who provide the service of continuously bidding for securities that investors want to sell and offering securities that investors want to buy. This person or company quotes both a buy and a sell price in a financial instrument or commodity held in inventory. Dealers earn a profit on the bid-offer spread. Most foreign exchange trading firms are market makers and so are many banks. The market maker sells to and buys from its clients and is compensated by means of price differentials for the service of providing liquidity, reducing transaction costs and facilitating trade. The NASDAQ, many OTC markets, and the Forex are structured this way. 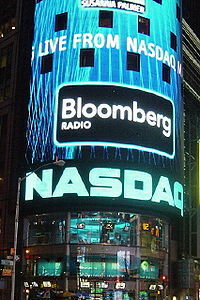 NASDAQ: NASDAQ is a major example of a secondary quote-driven market.